The proposed mechanism for increased amounts of the sun's geomagnetic activity having an impact on the Earth's Climate is quite complicated, since there are many ways in which the sun can impact the climate. One of the most famous ways is with the reduction in Cosmic Rays reaching Earth. The reduction in Cosmic Rays creates fewer Low Clouds, and since Low Clouds have an overall cooling impact, a decrease in these clouds would lead to a warming impact. Why does increased geomagnetic activity create lower amounts of Cosmic Rays? Because of higher amounts of Solar Wind preventing the Cosmic Rays from reaching Earth. Indeed, there are strong correlations between temperature and various solar output variables. Georgieva et. al 2005 used the Geomagnetic AA Index to quantify the solar impact on Climate Change, rather than the sunspot number, because using the sunspot number to quantify the solar contribution to climate change, as many studies do, leads to an underestimation of the Solar impact on Climate Change. The above figure from Georgieva et. al shows the Geomagentic AA Index with the broken line, and the Global Temperature Anomalies with the solid line. 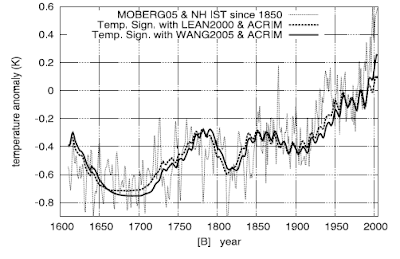 They find that the correlation coefficient between the AA Index and Global Temperatures is 0.85, meaning that the sun can explain 85% of the variances in temperatures over the last ~150 years. Cliver et. 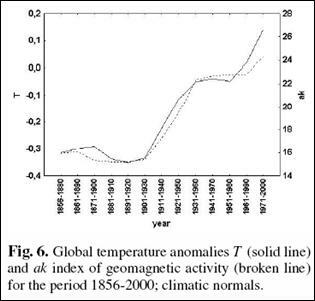 al 1998 also used the Geomagnetic AA Index to estimate the solar contribution to climate change. Above figure: From Cliver et. al 1998. The AA Index is the dotted line, and the solid line are the temperature anomalies. They found that 50-100% of the warming could be due to the sun, but it should be noted that this analysis does not include other factors like volcanic activity and anthropogenic greenhouse gas emissions when estimating the total contribution. Nonetheless, this study also shows that other studies which do include these factors are only at the lower end of the 50-100% range for the solar contribution over the last 100-150 years. It also supports other studies with a larger solar contribution to climate change because of the remarkable correlation with the AA Index and temperatures. Scafetta and West 2008 adresses the uncertainty raised in the first paper. If a TSI curve that shows an upward trend from Solar Cycle 21 to 22 is used from the ACRIM TSI composite rather than the flat PMOD TSI composite, then a higher contribution from the sun would be needed. The authors find that up to 69% of the variances in temperatures can be explained by solar activity. The image above from Scafetta and West 2008 shows the divergence between the PMOD and ACRIM TSI datasets, which makes attribution to past climate change even harder. 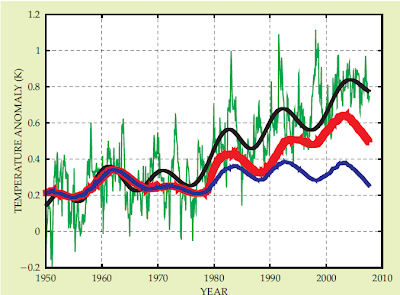 The red curve is the ACRIM TSI composite, the blue curve is the PMOD TSI Composite, and the black curve and green line are the Global Temperature anomalies. The ACRIM verses PMOD controversy continues in this paper. 50% or more of temperatures can be attributed to the solar forcing, depending if the ACRIM TSI composite is used or not. This further adds on to resolving the uncertainty between the PMOD and ACRIM datasets during the ACRIM Gap. The graph above from Scafetta and West 2007 shows the excellent correlation between solar activity and temperatures. It also shows that a large portion of the warming can be attributed to solar activity. Over the last 30 years, a significant portion of the warming can be attributed to solar activity if the ACRIM TSI composite is used. Ogurstov 2007 estimated that the solar contribution directly and indirectly caused about 0.25-0.35 degrees C of the warming that took place during the 20th Century. Using the Skeptical Science trend calculator gives an approxiate warming of 0.6 Degrees C during the 20th Century. This means that 41-59% of the trend upward can be attributed to solar activity over the past 100 years. Blanter et. 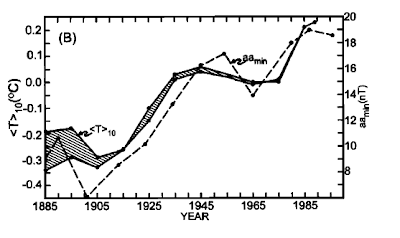 al 2008 found that temperatures correlated remarkably well for all periods between the solar activity indicies and the observed temperatures for stations in Europe and the United States during the 20th Century. They used a finding from a previous study that the temperatures at weather stations correlated remarkably well if they were up to a 1000 km distance from each other. They also state in the abstract that these changes can "possibly" be extended onto a Global scale. 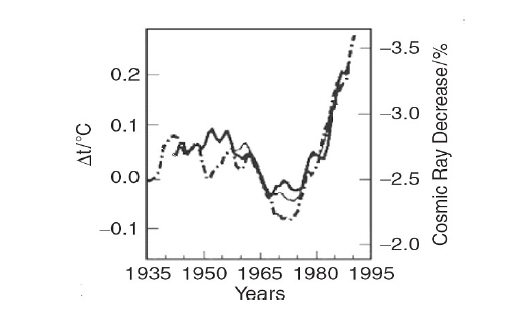 This figure from Dorman 2012 above combines the global temperature anomalies to the Cosmic Ray Flux (CRF) from 1937-1994. There is a very good correspondance between the two variables, suggesting that Cosmic Rays (modulated by solar activity) play a large and dominant role in current climate change. So there appears to be a VERY strong relationship between various solar parameters and temperatures over the last 100 years! Does this imply that Cosmic Rays are the cause of climate change. Not quite, since correlation does not imply causation, but there is a large range of evidence that suggests that Cosmic Rays have a large impact on the atmospheric parameters. Yuri Stozhkov (who was also one of the authors in the CERN paper) et. al found that during large Forbush Decreases, there are precipitation decreases observed, suggesting that this is a cause from a sudden decrease in Cloud Cover. Dragic et. al 2011 found that with Forbush Decreases exceeding a GCR decrease of 7%, a noticeable increase with the DTR was observed. This can only be explained through cloud cover decreases, since clouds reduce the DTR range, and a decrease in cloud cover would create an increase in the Diurnal Temperature Range. Svensmark et. al 2009 used 17 Forbush Decreases (large and sudden decreases in Cosmic Rays after a Coronal Mass Ejection) after 1998 (since this is when AERONET started) that were above a 7% decrease, and compared these changes in GCRs to corresponding changes in aerosol particles. Aerosoles are the "seeds" to cloud formation. Without these, water vapor droplets would not be able to condense onto a physical substance to form a cloud. Svensmark et. al found that for each FD event analyzed, a sudden decrease in aerosoles was also observed. This indicates a significant GCR impact on the atmospheric composition. Regardless of if it is Cosmic Rays or not, CMC, (though there is much evidence for a GCR-climate connection), an amplifying mechanism is needed for the sun-climate connection. a calorimeter to measure the radiative forcing variations associated with the solar cycle. mechanism, though without pointing to which one. There are many more papers than this documenting a strong solar influence on the climate, I just wanted to give a snapshot of the various pieces of evidence for solar driven climate change floating around in the scientific literature. This is a forum about environmental issues not in depth geophysics so If you want a sensible discussion I suggest you go elsewhere. I don't agree that exotic magnetic fluxes are driving temperatures while adding billions of tons of a proven greenhouse gas is having a benign effect, but that's just me (and 97% of climatologists) but what do I know I'm not an amateur climatologist. However in the unlikely event that this has merit it means that one thing threatening the future we don't have to worry about, we still have to worry about soil degradation, over-fishing, depleation of groundwater aquifers, peak oil, nitrate pollution acidification of the oceans due to increased CO2 levels overpopulation, deforestation, etc. etc. Except for the last decades as the abstract of the paper indicates. However, in the last decades solar activity has remained more or less constant while surface air temperature has continued to increase, which is interpreted as an evidence that in this period human activity is the main factor for global warming. This is a "highly" cited paper too, which is why the other two authors referenced this paper in theirs. for which we have data. Global Warming is an environmental issue, is it not? The sun causing Global Warming is a plausable cause for this warming, is it not? Therefore it has every right to be here, as much as your arguments about CO2 causing warming have a right to be here. Oh and 97% of climatologists don't agree that human activity is the dominant cause. I had a problem quoting snowy multiple times so I put his comments in blue. Global Warming is an environmental issue, is it not? . Well if your right there is not a lot we can do about it so not much point discussing it as an environmental issue. Sounds a reasonable proposition on the surface but trust me I have and many other people have looked into it, It may plausible but not probable. I think its reasonable for it to be discussed I was just suggesting if you want an in-depth conversation about it you go elsewhere. Personally I don't think that is reasonable that every thread that touches on climate change should be hijacked by someone with an obsession about a nonmainstream theory into a graphspam feast. Boldly telling people including actual scientists that they are WRONG when they say pretty uncontroversial stuff that can be confirmed in a basic textbook on the subject annoys me as well. I don't think it helps the quality of the forum. Well I could be wrong about the percentage I'm sure it varies with what blog you read but I'm certain its correct to say the vast majority of qualified people working in this field would disagree with your solar geomagnetic flux thingy. Why would they make the reference to the use of sunspot data like that in their abstract? I quoted form the abstract for the paper. Also if you look at the chart you see the diverging lines are pretty far apart and continuing at very differetn slopes. This started in about the 1951-1960 range too. Yes there is not, because it is a natural occurance. Why is it not probable that solar activity is the dominant cause of the 20th Century Global Warming? Boldly telling people including actual scientists that they are WRONG when they say pretty uncontroversial stuff that can be confirmed in a basic textbook on the subject annoys me as well. I don't think it helps the quality of the forum. What am I telling scientists that is wrong that is not considered to be controversial? I'm certain its correct to say the vast majority of qualified people working in this field would disagree with your solar geomagnetic flux thingy. You have some evidence to support that last claim? I have seen two different methods used to reach the same conclusion on the level of support by climatologists, but no other research to refute that determination. As an introduction to the point they are trying to prove, since many people use the SSN to quantify the solar forcing. Does the trend over the last decades in their paper with the AA Index look "constant" to you? How else do you interpret these sentences? solar activity, and it is highly correlated to global temperature variations in the whole period for which we have data. Not according to the evidence we have it is not. There is no evidence to support the dominant mechanism, as you have already admitted. Without such evidence it cannot be deemed probable any more than the inverse pirate numbers can be deemed probable. Given the massive lack of citation of the works on geomagnetic flux theory and the apparantly small number of authors involved in writing on the subject, I doubt that very much. No, it looks very inconsistant when compared to the temperature graph with which it is supposed to be connected so strongly. They use smoke and mirrors on you and you believed it. The whole period covers from 1856 onward, so even with the diverging rates over the last three decades the comparison for the whole period would match for ~85% of the time frame. the ~15% that does not is the really important last three decades mentioned. So there is no point posting on a forum about environmental issues, I suspect your here to annoy people not to test your theory. You need me to explain that again? firstly the sun did not do anything for 2000+ years and just when the industrial revolution kicks in the geomagnetic flux or whatever goes haywire. Robert Northrop is a scientist Wayne Stollings is a scientist a few others that you have crossed swords with are scientists. and butting in on a thread to tell everyone how your pet theory makes all our concerns irrelevant is rude.